Whatever qualifications they bring to the board, today's rural hospital trustees face a steep learning curve, Linden says. Trustees must "study the whole changing landscape of health care, which may require more frequent attendance at conferences and meetings intended to prepare trustees for dealing with these issues." Linden says GRMC utilizes board education materials available from the Center for Healthcare Governance of the AHA. The Center's website, www.americangovernance.com, offers resources such as "competency-based board member selection tools." "The issue is not just indicating that it would be lovely to have board members attend a conference every other year or sit in on a webinar, but really having a process for establishing exactly what the educational needs are for a board, and laying out a framework for them to be able to attain that," Linden says. GRMC requires that trustees obtain certification from the Iowa Hospital Association. "Board service has never been more challenging," the association states on its website. "Hospitals and health systems need dedicated and knowledgeable individuals who are willing to commit their time, experience, expertise and leadership to the hospital, its mission and the community." · Understanding and embracing the need for governance accountability. · Governing according to a standard of excellence. · Willingness to formally certify adherence to governance best practices. · Commitment to coordination of resources in communities. · Embracing community accountability and transparency. · Structuring community benefit and outreach programs to meet identified community needs. · Utilizing data from the IHA to identify and address areas of need, especially regarding the uninsured and underinsured. · Utilizing performance data to identify opportunities for improvement and monitoring progress to improve quality and safety. · Integrating local health efforts with state programs. Bell says the Kansas Hospital Association also provides hospital trustee education. "We spend a lot of time going to hospital board meetings and talking to trustees about the role of the hospital board in the current environment. We put on a hospital trustee education program every year where we try to bring in national-level education resources. So it's possible, but it's very challenging in a rural area." Leifer says educational programs for rural hospital trustees should be contextualized. "These people don't have time for broad-based education that's theoretical. It absolutely has to be within the context of the ongoing viability and survival of their hospital." One of the most crucial decisions facing rural trustees today is whether their hospitals should remain independent or affiliate with a larger health system. "They must be objective when assessing opportunities for merger, acquisition or affiliation rather than being guided by distrust of other providers or concern over abdicating their responsibility to the community," Leifer says. Putnam, with Margaret Mary Health, says whether to affiliate is the most common question that small, independent community hospitals must deal with — and it's a tough one. "When you make the decision to affiliate with a larger system, you've given up your hospital's mission. That mission goes away, and it's replaced by whatever the system's mission is. That could be better and that could be worse, but it's definitely different. So, independent community hospitals struggle with that." Putnam notes that affiliating with larger systems has not made rural hospitals immune to closures. However, he says small and rural hospitals should take the affiliation route "if they can fulfill the needs of their patients better by being part of a system." Affiliating with a larger system frequently results in a different role for the trustees of the smaller hospital. That role may vary, depending on how tight the affiliation is. 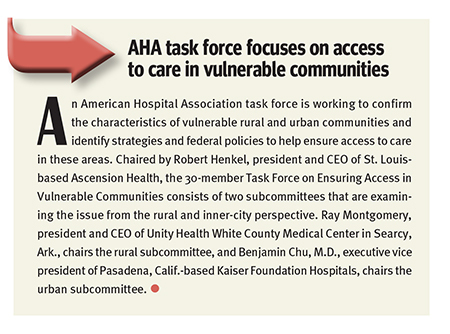 "I would say, as a general principle, that local community boards are important, particularly around the issues of quality, safety, physician credentialing and assessing and advocating for the community need," says the AHA’s Combes. "They're going to be the closest people to that community." GRMC is an independent hospital but has an affiliation agreement with Mercy Health Network, based in West Des Moines, Iowa. "It's given the board access to a number of resources that it would not have had otherwise," Reding says. "For example, a representative from the Mercy organization attends our board meetings and is able to report on trends and best practices they see among other Mercy-related organizations. We're able to turn to Mercy for recruitment assistance and participation in group-buying organizations." CEO Linden says GRMC is currently evaluating its agreement with Mercy Health Network "and looking to see if a tighter relationship may be of value to us as we move forward. It could be a management contract with the Mercy Health Network. It also could involve a complete ownership arrangement." Beartooth Billings Clinic, a 10-bed CAH in Red Lodge, Mont., is affiliated with Billings Clinic. "We are still autonomous," says Linda Harris, a Beartooth trustee. "We're a 12-member board. Three of those members are appointed by Billings Clinic, and the other nine members are community members." Harris says the local board "is responsible for everything that happens within our facility. We set and maintain our budget. We have our quality standards and all of our same committees." Nicholas Wolter, M.D., the CEO of Billings Clinic, says the two entities are "pretty tightly integrated. Billings Clinic employs the physicians. We employ the physician CEO and the chief administrative officer. But, as Linda said, the board remains independent except for a few reserve powers." The current relationship between the two Montana entities was finalized in 2010 — the year Beartooth Billings Clinic opened a new medical facility — following about 10 years of discussion. "We were very aware as a board that the status quo of our operating as a silo and trying to be viable on our own was not going to be an option that would continue to provide health care to our community,” Harris explains. “We didn't have the financial depth. And with an average daily census of two to three patients, any change in reimbursement or market share has a huge effect on us." The local board made its decision under the guidance of Kelley Evans, the former CEO and current chief administrative officer, whom Harris characterized as a strong believer in board engagement and board education. But, she says, the trustees also had to educate themselves as they navigated the decision-making process. "Some of it was through trial and error. We just kept our eye on the financials." Today, Harris says, she and her fellow trustees are looking at the possibility of an even tighter relationship with Billings Clinic. "We are finding that there are certain relationships, such as with vendors and insurance providers, that if we had a tighter relationship, we could perhaps see some cost savings and easier workflow." She would advise small, rural hospitals considering an affiliation with a larger system to "look at the big picture. Throughout the whole process, as we were dealing with very difficult questions, we took very much to heart that our job as trustees was to provide quality health care to our community and how best can we accomplish that. We kept that as our driving force."